To facilitate trade through a universal medium. To this end, both cash savings of national currencies (such as the US dollar or euro) and gold hold an important place in today’s global markets. Gold coins hold several advantages over cash accounts for storing wealth. It isn’t truly feasible to live without the availability of cash, if only because most governments establish a set national currency. Now that electronic transfers of value are possible, legislative control is the last great advantage of cash over gold. Gold, however, holds several distinct advantages over cash savings as a means of storing wealth and maintaining wide appeal. We’ll go over 5 distinct ways that gold bullion beats cash savings. Limited supply is the greatest reason to hold non-cash assets, whether that be gold or silver or oil or real estate. History has invariably demonstrated two things: that governments can’t control the urge to print more money and debase a national currency; and that gold retains value through the years. I explain why this is in another post. Gold’s value is not dictated by a central government, but rather through supply and demand. Its supply is strictly limited to what humans are able to extract from the earth. Its demand is multifaceted, since gold is valuable to a number of industries along with investing/currency considerations. Any value can be printed on paper currency…consider the 100,000,000,000,000 note from Zimbabwe. In contrast, national currencies have an effectively bottomless supply. Not only are colorful pieces of paper incredibly cheap to produce, but the values that are printed on those papers can be changed at the whim of central banks. If you want to store the value of your wealth, cash in the bank simply can’t hold a candle to gold bullion. US dollars are the closest thing to an international cash-based currency in the world. Many central banks purchase dollars to back up their own fiat currencies…but walking around Paris or Shanghai with a pocket full of greenbacks still won’t get you very far. No point in having a lot of US dollars in the bank. National currencies really only have value within the borders of a country, and only then because that government has decreed that the paper is valuable. Should something happen to the national economy, to the government or to the perceived worth of the cash…well then your cash savings are going to be at considerable risk. The CombiBar is designed to fit into a wallet, like a credit card. No matter where you go, the value of gold bullion will never disappear. When you place cash in a bank, the bank places it into a demand deposit account, meaning that you can withdraw the funds again whenever you’d like. However, the bank doesn’t actually hold on to that money – it lends it back out. Legally, banks are only required to keep 10% of all demand deposits in their vaults, while the other 90% can be lent back out. After the bank’s borrower receives the funds, there are now two people with legal claim to the same dollars (sort of…). *the Federal Reserve guarantees some demand deposit accounts up to a certain balance, and the government has technically outlawed bank runs. This only decreases the chance of losing your cash savings – it does not eliminate it. Conversely, physical gold bullion is not lent back out to anyone. It literally sits in a vault at a precious metals depository, safe and sound, not exposed to the whims of banking executives or Federal Reserve policy. In short, gold bullion retains value far better than cash savings, is more universally recognized and is not tied to the balance sheet of a lending institution. 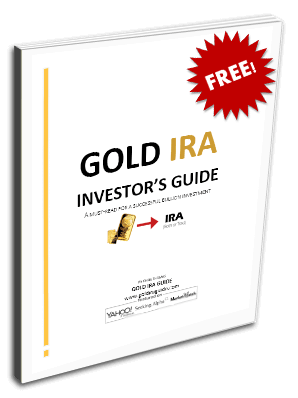 If you are interested in taking advantage of the benefits of investing in gold, request a free Gold IRA Investor’s Kit today. This kit is offered in partnership with Regal Assets, our #1 ranked gold investment company for 2014.